Description: Available in 4 3/4" and 5 1/2" barrel lengths. Made to fit most Single Action revolvers. Original maker - J.S. Collins & Co. in Miles City, M.T. This holster dates between 1880 and 1885. G.H. and J.S. 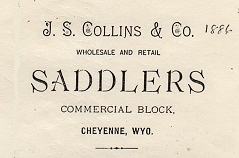 Collins had several saddle shops throughout the west, beginning in 1872. Their shop in Miles City opened in 1876. With their shop in Cheyenne closing in 1885, the Miles City shop followed two years later, closing its doors in February of 1887.